Once upon a time, a happy-go-lucky beagle named Guy found himself without a family or place to call home. Guy was just another down-on-his luck dog, three years old and homeless, but his fortune was about to change. A young woman named Meghan spotted him in the rescue shelter and fell in love-at-first-sight with him. Already the owner of a rescue dog named Bogart, she knew Guy had a lot to learn about being in a two-dog family, but he turned out to be a quick study. But little did he know that his happy new life was in for a big change! One day Meghan met her match when she fell in love with a British prince named Harry. He treated her like the princess Guy always knew she was. Guy gave his paw of approval. But gaining the approval of the whole royal family was something else. And Guy was game to give it a try. He liked the idea of living in a place like Barkingham Palace! But there were a lot of ways for a dog to run afoul of the royals. Digging holes in the gardens, leaving muddy footprints in the palace, and chasing squirrels up the royal trees could get him in trouble with the most importance personage in the kingdom--Queen Elizabeth II herself. Could he keep a stiff upper snout with the Queen's guards? Could he learn not to spill Queen Liz's tea? Could an American rescue beagle fit in with the queen's preferred pets, her pampered porgis? But Queen Liz is a noted dog lover, and although her beloved porgis Candy and Vulcan had to give Guy the sniff of approval, he was soon trotting through the garden with them on the Queen's daily walks. 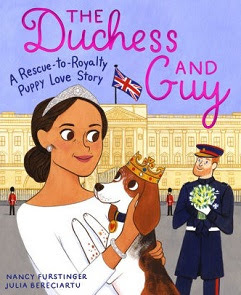 Noted animal advocate Nancy Furstinger's timely The Duchess and Guy: A Rescue-to-Royalty Puppy Love Story (Houghton Mifflin Harcourt, 2019) tells the true story of down-at-the-paws pup whose rags-to-riches story makes for quite a lost dog tale. Furstinger slips in a pitch for rescue animals, and with the help of artist Julia Bereciartu's pleasingly recognizable illustrations of Markle and all the royals (even little William and Charlotte), pup-loving kids will find this happy story of a homeless hound who found himself quite a family a really fun read. Everyone loves a happily--ever-after story, and with a new little royal expected this year, it looks like author Nancy Furstinger has the premise for a sequel just waiting to be written.